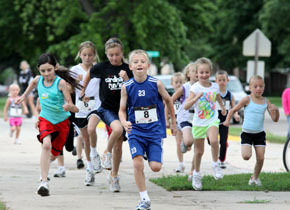 On an absolutely gorgeous June morning Saturday, ideal for running, 110 fitness enthusiasts of all ages participated in the 2011 Cardinal Run/Walk, according to event organizer Nicole Levander. 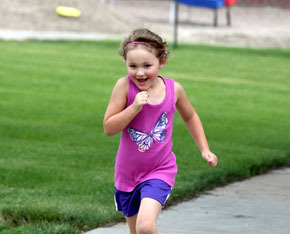 Striders ranging from age 72 to mere toddlers took part in a 5-mile run/walk, along with a shorter run/walk and a 1-mile kids’ run, beginning and ending at the Boone County Fitness Center. 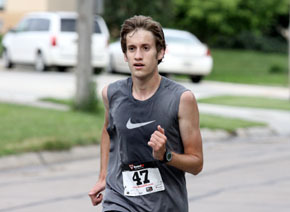 Former Boone Central standout and current University of Nebraska-Kearney runner Kevin Carder (age 19) was the overall race winner in a time of 28:35. 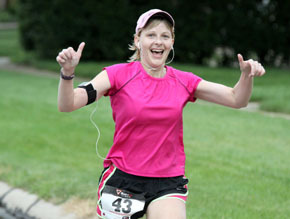 Roxi Erickson (47) of Omaha was the overall female winner and 5th overall in 34:30. Current Boone Central Cardinal Brody Kelley (17) took 2nd place overall and among male runners in a time of 32:18. Halie Smith, Boone Central graduate and a track & field/cross country competitor at Doane College, was 2nd to Erickson among females and 6th overall in 35:00. A brother-sister combo from the prodigious Erickson running family led all youth in the 1-mile kid’s run. Trevor Erickson of Fairbanks, Alaska was the overall race and boys winner in a time of 9:21 and Jenna Erickson led all girls in 9:32.